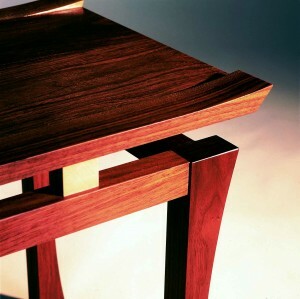 Over the years our Torii side tables have been a very popular item. It has been 11 years since I designed and made my first set for an enthusiastic client who posed a very open brief, “just have some fun” she said. 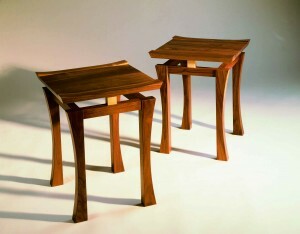 That first set was in lacewood with walnut details, since then we have sold them to clients all over Britain and Europe. 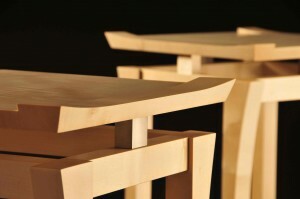 The numbers around Torii tables seem to make sense, over 11 years we will have made an edition of 11 pairs. I say ‘pairs’, but there is an exception to that rule, one client did commission a set of 3 – the only set of of 3! So we are now making another 3 pairs, I’m planning to stop at 12 sets in 2012 so just one more set and that will be that. I do feel a bit sad about it, but at the same time it feels right to limit the numbers, otherwise they won’t be special to me anymore. I’ve no idea what timbers that last release will be in, but I do have a little time to think about it now.